Almost done with the Australia thing. But let's get personal for a second. Just want to share from my own life why this sort of thing matters. I remember when I was in High School, back in the early '80s, when we had two exchange students from Australia join our class. I didn't know much about Australia other than that they had weird animals and that the English had colonized the place. You may remember that this was around the same time that South Africa was often in the news because pressure was mounting for the white minority to ditch its racist apartheid dictatorship of the black majority. Some of us were discussing South Africa and I remember (and always have remembered) one of the Australian girls comparing South African and American racism to that of Australia. Someone pointed out that what was going on in Australia with the Aborigine community was no different than South Africa, or what had been done to the Native Americans. "The aborigines are not like black people here," she said in all sincerity. "They're hideous. They have such ugly noses and faces. Have you seen them? Plus, they don't work. They just drink and wait for assistance from the government. ..."
I don't believe I ever spoke to her again. Her words cut right through me, because I had heard them before about my people. I wrote her off as ignorant. As a racist. As not worth my time or effort in relationship. But not only did I write off this girl, I wrote off Australia. You see, almost instictively, I assumed that this girl did not exist in a bubble. She couldn't be the only Australian to think like this. She had to come from and environment that had taught her to think and believe this way. So, in my mind, this was typical of Australia. I already had this kind of thinking about people coming from the British seed to begin with (will share more about that bias in my head later), so this was just another confirmation. So, one girl's goofy comments had colored my thinking of an entire people. No big deal? Childish simplicity on my part? Those thoughts never left me. Though I've met and liked other Australians since ... though I've aged and matured and dealt with all sorts of cross cultural issues ... though I've been working on inner healing and reconciliation, etc. (and even though I love the way they talk!) ... I had never really dealt with the attitudes I have kept deep inside me toward this country. I figured that even the Aussies I'd met and liked were somehow, at least remotely, programmed with this sense of superiority over people of color. Never had I brought this attitude to the surface so I could deal with it. Listening to Kevin Rudd acknowledge wrong, apologize and ask forgiveness did something in me. I can't explain it. He wasn't even talking to me. He was saying it to the Aborigine people. And even though he had limited the apology to the "Stolen Generation" of mixed race native Australians who had been taken as a policy from their families up until the 1970s, rather than also apologizing for the genocidal way the people as a whole had been treated from the time the British arrived on the continent, I still was moved. His heart connected with me, and I was able to give him the benefit of the doubt. This was as much a political concession as anything else, I sensed. I believe Rudd knew that the Australian people were not ready to repent that deeply. So he repented specifically for something the government was responsible for on behalf of the government (as if that democratically elected government had not acted out the will and attitudes of the people it represented). It didn't matter. I believed in this man's heart. And even if he was the sole Austalian who understood and repented, it mattered to me. Just like it mattered when one Australian exchange student had such ignorant thoughts and words when I was in high school. If Rudd's words and heart changed the attitudes of a black American living in Paris, how much more life changing they must have been for countless native Australians. This is the sort of thing that Rudd's critics, and those who think apologies for the past are silly, fail to understand. This was not like George Bush in Senegal, when he essentially said that slavery was bad. Similar recognitions that some bad things happened in the past have been offered up by Western heads of states over the past years. But Australia's Prime Minister Kevin Rudd blew me away in delivering on his promise to apologize to the indigenous Australians. Check it out for yourself on this clip. You see that he takes specific responsibility for specific wrongs. He names them. He names the victims. He elevates them to the status of people deserving of respect, honoring them and their ancestors. You won't see it on this clip, but if you check out the entire speech Download 20080213-rudd-apology.mp3 you'll notice he does something else. He demonstrates that he has lingered in the mess, facing the wrongs that were done instead of fleeing. He talks about people he's met. He shares their painful stories, thus honoring them and others like them. He demonstrates that their stories matter and that they are not to be ignored. In this, he says that they belong in Australia. That their story is part of Australia's history. He then talks about concrete steps to try to address the results of the wrongs of the past. This is a bold but necessary part of the reconciliation process, and a part where the process usually breaks down. He understands, and says, that building a new future requires dealing effectively with the past. He has taken a good first step. Here's a prayer that the next leader of my birth nation will follow Rudd's lead in dealing with its past wrongs to the native population, to slaves and others. And I would love to see my current nation of residence, France, learn from this example as well. You may remember that the new prime minister had promised to apologize for one particularly repugnant offense against the country's Aborigine people. Well, today they made good on that promise. If you've been following the discussions on this blog about reconciliation, or if you happened to be there for the Reconciled seminar, you will recognize all to well the themes that come out in this CNN report on Australia. * Notice the affect the apology has on one of the offended. What are her words? * What was the argument of the former prime minister for refusing to apologize? * What is the fear of the conservative commentator. If we apologize, what's going to happen to us? You can bet this clip will be studied in future seminars. The more I watch these reports from all over the world the more predictable the arguments become. It really is like a textbook. Victims and their descendants need the past to be acknowledged in order to give their lives (and that of their ancestors) a sense of worth. The descendants of the perpetrators want to focus on the present and the future (which is convenient sense they are in a pretty good position based on what happened in the past). The descendants of the perpetrators fear losing something (status, wealth, self image) if they apologize for the past, so they resist doing so heartily. It is extremely distasteful to them. Everyone remains chained to a past that is unreconciled. And in the end, the result is a continued focus on us versus them. Again, in the Kingdom, can this sort of thinking exist? Hats off from this blogger to the Australian government for taking this step. Let's pray that it opens doors to continued understanding, forgiveness and reconciliation rather than resistance, rejection and enmity. We are pulling for you, Australia. The rest of the world needs to see what is possible and how it's done. Perhaps America will someday apologize to its native peoples as well. By the way, did you notice who Australian Prime Minister-elect Kevin Rudd has named to his cabinet? 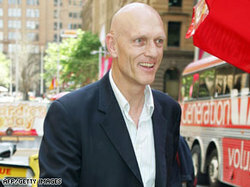 The name Peter Garrett probably means nothing to you, but if you were a young person in the 80s you probably saw his mug on MTV. He was a member of the rock group Midnight Oil, whose best-known song was called "Beds are Burning." And, if you never listened to words, you might not have realized that it's a song of repentance for the Australian treatment of the continent's native inhabitants. I had even been planning to use this song in the reconciliation seminar we are developing. Perhaps it's no coincidence that Rudd has said he will apologize to the nation's Aborigine community. Garrett had been Labor's spokesman on climate change while in opposition. I was planning on getting to Australia later, because that country's history is another prime example of the disconnect between the West and the Rest when it comes to dealing with the past. 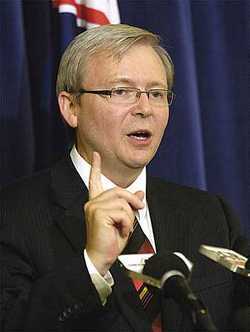 But the election of Kevin Rudd as prime minister has pushed they country ahead on my agenda. Rudd is planning to make good on a campaign promise to formally apologize to the nation's indigenous peoples (commonly referred to as Aborigines) on behalf of the nation. This would come more than a decade after a landmark inquiry found that past policies to remove indigenous children from their families amounted to "genocide." What's interesting is that current PM John Howard has been a perfect example of the common Western attitude toward past injustice. Outgoing Prime Minister John Howard angered many of Australia's 450,000 Aborigines and their supporters by steadfastly refusing to offer an apology, arguing this generation should not be made to feel guilty for mistakes of the past. Keep in mind that the practice of taking children was only the most recent of genocidal practices carried out against the Aborigines since the time English settlers arrived on the continent. And that this process only ended in the 1970s. So we're not talking about apologizing for something that happened generations ago. The people responsible are still alive. The victims are still alive. But Howard represents a need, a desire, of many of his constituents. It's the need to avoid facing an ugly part of ourselves. We need to run from it and avoid it. It's the past. It wasn't me. Not my fault. If you read the article in the link above you will see many of the same themes we always see when it comes to injustice and reconciliation. Victims need for the past to be recognized and acknowledged. But they are also looking for more than words. Something should change. Repentance means a change of course. And the offenders, or their offspring, typically deny any connection to the past misdeeds. It's a matter of personal survival. These acts go against everything they have been taught to believe about themselves. So they simply refuse to be attached to these things. They shift the discussion toward the future. French President Nicolas Sarkozy has exemplified this tendancy in his dealings with France's history with Africa. "Young people on either side of the Mediterranean are looking to the future more than the past and what they want are concrete things." "They're not waiting for their leaders to simply drop everything and start mortifying themselves, or to beat their breasts, over the mistakes of the past because, in that case, there'd be lots to do on both sides." Of course, he's not entirely off track there. Words are not enough. Concrete actions demonstrate that we are truly "sorry." But he's missing the important role that recognizing past wrongs has in establishing a peaceful future. I would even argue that it will be difficult to muster meaningful acts that will truly build toward peace if we have not dealt with the wrong-hearted attitudes of our past. Our acts will be self-serving and superficial, perhaps even fueled by the same core misguided thoughts that brought us to those harmful acts of the past. Rudd in Australia is talking not only about apologies, but action too. By the way, here's a quiz. Has any American head of state ever officially apologized for what was done to the Native Americans? The similarities between what happened in the U.S. and in Australia are haunting when you read the histories. I found a joint resolution submitted by Senators Sam Brownback (R-KS), Ben Nighthorse Campbell (R-CO) and Daniel K. Inouye (D-HI) on May 6, 2004 on the National Day of Prayer. Here's a news story about the resolution. Reaction from Native American spokespersons falls right in line with what you see each time talk of reconciliation comes up. There is an appreciation that past wrongs are finally being acknowledged. But there is a deep sense that words are not enough. People are looking for repentance, not just apologies. Apparently, that resolution never went anywhere. In May of this year, its latest incarnation passed out of a committee. Obviously, this has not been on the front-burner! Anyway, here's a quote from Brownback's statement after the committee approved the resolution. "It is past time for us to heal our land of division, and come together as one people. We cannot erase the past. We can, however, acknowledge our past failures, express our sincere regrets, and work toward establishing a brighter future for all Americans." Here's a Mennonite church response to the resolution. What do you think?